JNN 06 May 2014 Tehran : Iran’s police chief has hinted that his country would seal its border with Pakistan any time. “It is very important to ensure security on the eastern border,” Brigadier General Ahmadi Moqaddam was quoted as saying by state-run IRNA news agency on Sunday. Iran’s southeastern Sistan-Baluchestan province borders Pakistan’s southwestern Balochistan province. Tehran has already put in place extra security along the border following the kidnapping of five border guards last month. “Sealing the eastern borders will soon result in major changes in Sistan-Baluchestan province. We will witness major changes and developments in this region by sealing the borders,” Moqaddam told journalists in Tehran. He vowed a ‘crushing response to any terrorist who dares to threaten’ the country’s border security. “We pursue any assassination and murder until resolving the problem,” he said while pointing to terrorist acts in Sistan-Baluchestan. Moqaddam referred to the emergence of Jeish al Adl terrorist group after Jundollah ringleader Abdel Malik Rigi was arrested and executed in Iran. “A new terrorist group has started operation to continue Rigi’s work since last year and it has committed murders in the southern parts of the country and they attack people under the cover of defending the Sunnis, while everyone knows that we are not practicing religious segregation and discrimination,” he said. “The people of that region are not happy” with the group’s operations either “because insecurity halts progress and advancement”, he added. 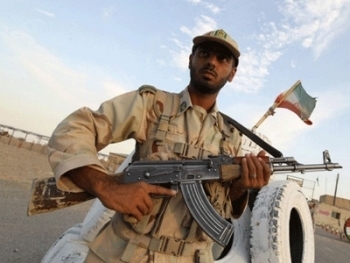 Five Iranian border guards were abducted by Jeish al Adl in early February. Four of them were freed after two months, while the fate of the fifth one is not clear yet. Last month, President Hassan Rouhani in a meeting with Pakistani Prime Minister’s Special Envoy Sartaj Aziz in Tehran underlined the need for the removal of security concerns at the two countries’ common border. “The Islamic Republic of Iran believes that security and tranquility in Pakistan is interrelated with its own security and tranquility,” Rouhani said during the meeting. This entry was posted in Asia Pacific, Iran News, Pakistan News and tagged Ahmadi Moqaddam, iran, Iran Pakistan Border, Islamic Republic of Iran, pakistan, Tehran. Bookmark the permalink. a wise decision by Iran- this bandit country should be treated like pariah that they are!